Frecclesham is based on BR Southern Region practice and inspired by a prototype location. It appeared in the September 2014 edition of the Railway Modeller. Pictures from the magazine photo shoot can be found on the Frecclesham RM 2014 page. 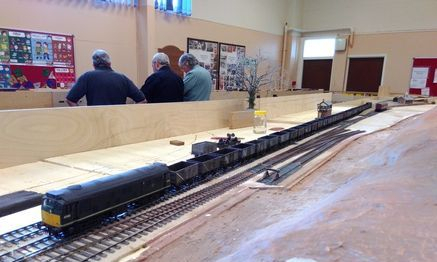 The purpose of Abergavenny Blackbrook is to be a simple, small P4 layout to take on the Exhibition Circuit. It fits into two estate cars and, with an eye to the future on Little Mill Junction, provides a platform to test and stress locos, stock and coupling systems and develop and hone techniques. It is designed for quick construction using commercially available items, such as baseboards, kit turnouts, ready-to-plant buildings, etc. where appropriate. Its track plan was conceptually based on that of Frecclesham, which gives plenty of opportunity for a reasonable operating sequence, but without its compound turnouts. Work is proceeding apace (see ClubGoingsOn) and it is planned to have it ready for exhibition early in 2018. Little Mill Junction is an ambitious long-term project. It breaks new ground for the club as is based on a real location. Little Mill Junction being just north of Pontypool. It is being built in 4mm/ft scale to Protofour standards, the trackwork reflecting BR(WR) practice and represents the track plan, elevations, and topography of Little Mill Junction and its immediate environs as they were in Autumn 1954 as accurately we can within the space constraints available. We aspire to operate as closely as practicable part of the working timetable of a weekday in October 1954 (prior to the closure of the Monmouth branch to passenger traffic) with trains of prototypical length and formation (within the space constraints available).